1) They both like firing people. 2) If anyone is ever going to do something about Trump’s hair, Romney is the best person to do it. 3) They have a lot of things to share about bankruptcies. 4) Mitt wants to hang out with the cool guys and celebrities, and Donald was the coolest of the three people willing to to hang out with Mitt. Seriously, even Octomom, Casey Anthony, and George W. Bush have told Mitt they had to wash their hair. 5) Romney wants to get a spot in Trump’s “The Apprentice”. 7) Romney and Trump had bonded over their investment losses in the Facebook IPO. Or, as they refer to it, became friends on Facebook. 8) Compared to Trump, Romney does actually look like a reasonable moderate. 9) Mitt thinks that Donald is a perfect representation of the average American. Also, Donald Trump is the embodiment of the American Dream: after all, he had lost everything but pulled himself up by his hair. 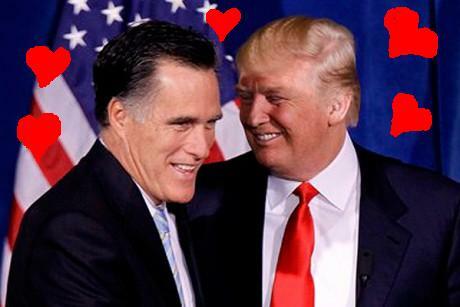 10) By sucking up to Donald Trump, Mitt Romney wants to keep Donald obsessing about Obama’s birth certificates, and not caring about Romney’s birth certificate. And Romney better keep Trump away from his birth certificate: check out this article explaining why Mitt Romney birth certificate is a fake. This entry was posted in Humor, List of 10, Satire and tagged Apprentice, Donald Trump, elections, humor, Mitt Romney, Political satire, Politics, Romney, satire, Trump. Bookmark the permalink. How awesome would it be to see a special season of The Apprentice with contestants culled from the Republican primaries? Or was that what actually went on? That would be awesome, agree. I might even start watching the Apprentice just to see all of them get fired. I think they prefer hiring someone else to do it for them. That would count as job creation too. Reblogged this on Michelle Rodriguez Posts.